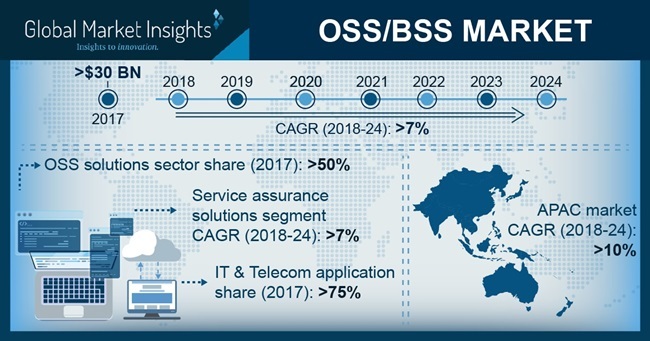 Operations & Business Support System (OSS/BSS) Market size is set to exceed USD 50 billion by 2024, according to a new research report by Global Market Insights, Inc. The OSS/BSS market is propelled by the increasing trend of outsourcing services in the telecom industry. As telecommunication service providers grapple with the increasing amount of data, they also need to focus on providing innovative services that will aid them in retaining customers. Numerous companies are willing to outsource their OSS/BSS functions so that they can concentrate on next-generation products and services. By outsourcing OSS/BSS workflows to an independent service provider, telecom companies are achieving an improved level of customer service assurance. The independent OSS/BSS partners offer specialized expertise and deliver services with defined KPIs including hosting, support services, application operation/administration along with the responsibility for the adoption of new network technologies. The growing adoption of cloud services among the Communication Service Providers (CSPs) is also augmenting the demand for the OSS/BSS system. The growing demand among organizations for the scalability and flexibility along with the rising need to reduce the cost of operation is encouraging CSPs to opt for alternative delivery models. Cloud computing significantly reduces the software and hardware requirements of networks and platforms. Cloud allows the operators to provide an infrastructure on demand and scales the computing capacity. Such elasticity allows rapid solution deployment and enables service providers to improve time-to-market by scaling hardware and software resources. Service assurance segment in operations & business support system market is anticipated to attain the growth rate of over 8% during the forecast timeline. The market is driven by the rising needs among enterprises to provide enhanced customer experience. As the customers are becoming more empowered due to rapid digitalization and easy availability of information, organizations start to focus more on improving enhanced customer experience to boost their churn rate. Cloud deployment is projected to grow at a CAGR of about 10% during the projected period. Cloud models allow organizations to benefit from best practices, document operational procedures, and are well-proven business models. The cloud model also offers flexible configuration and re-usability, which simplifies the process of launching a new service. Moreover, the model also enables organizations to streamline their business process. BFSI sector emerged as the major end-user of the OSS/BSS market. It is estimated to grow at the CAGR of more than 11% during the forecast period. As the BFSI sector is moving more toward digitalization and automation, it is looking for more advanced solutions to analyze the information from numerous areas to develop its own competitiveness. The OSS/BSS system allows the organization to analyze the data and financial situation of an organization. The system also enables financial institutes to streamline their operations, scale up their operation, and develop more effective marketing strategies while keeping the cost of the operations low. The Asia Pacific operations & business support system (OSS/BSS) market is estimated to attain a noteworthy growth at a CAGR of over 10% during the forecast timeline. The increasing penetration of the internet and 4G network among the emerging economies including India and China is the primary factor driving the market growth. The rapid deployment of cloud computing services among the SMBs in China and India also augments the demand for the OSS/BSS system in the region. The market is characterized to be highly competitive due to the presence of several multinational and regional players. Some of the prominent vendors in the OSS/BSS market are Amdocs, Accenture, HP Enterprises, CSG Systems, Ericsson, Netcracker, Optiva, Microsoft, Tata Consultancy Services (TCS), Oracle, and IBM.